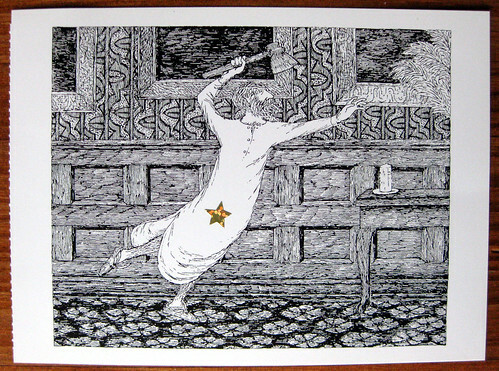 Today I share with you two postcards from Edward Gorey's "The Glorious Nosebleed." The book illustrats adverbs, so each postcard (a page from the book, I assume) has a bizarre statement with a capitalized adverb. 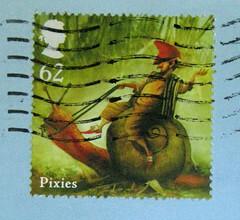 This one went to the gal on Sendsomething (which appears still not to be working) who sent me the awesome Bat Lady Postcard I blogged about yesterday. I thought it needed a spot of color, so I gave him a gold star on his nightdress. This one went to Andy for his lovely postcard blog, My Real Wall, aka "A REAL wall displaying REAL posts by REAL people (BETA Version)". If you're looking to send a postcard to a mail aficionado, I do recommend sending him one. His address is on his blog page. Then he'll post a photo of your postcard on his wall. As for the postcard, I love the poor little teddy bear in the corner. So Gorey. The "Hopeless" one is amazing! Thanks for sharing. I love "Hopeless" Missive! It's now on display again on my REAL wall - have a great time in the woods! Where did you happen upon these? I have loved Gorey for years & would love to have a set!!! I got this particular set in a bookstore. 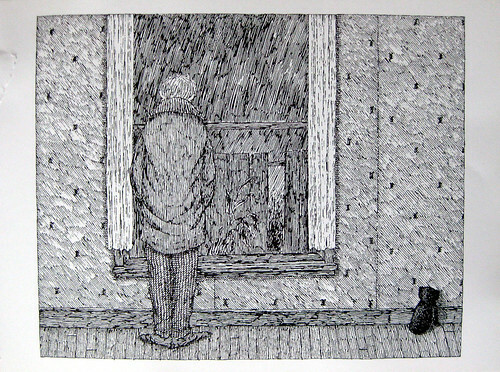 Bookstores that sell postcard books often carry Gorey... I don't know about online sources. Sometimes you can find them on amazon.